*The final official surrender of Japan is accepted by the Supreme Allied Commander, General Douglas MacArthur, on board the American battleship USS Missouri in Tokyo Bay. *Ho Chi Minh announces the Vietnamese Declaration of Independence. *The Volkswagen makes it’s way out of Germany. It’s described this way in the newspaper: BRITISH ASSERT ‘VOLKSWAGON’ HAS GOOD POINTS: The German peoples’ auto on which hundreds of thousands of Germans gave a down payment and received only Hitler’s promise in return, has been tried out in Britain and has received favorable reports by most of the motoring experts writing in the British newspapers. They say that altho its finish and standard of engineering are far below British light cars, the volkswagon suspension system with … rear engine, road-worthiness, and economy in gasoline could well be incorporated in a British automobile to sell below $400. 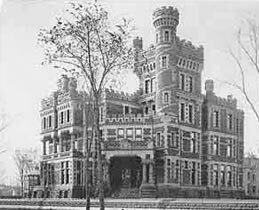 *Big news in the Tribune: PALMER CASTLE SOLD FOR RAZING – Skyscraper Apartments to Be Built on Site: The world famous Potter Palmer mansion (photo), at 1350 Lake Shore dr., built in 1882 at a cost of more than a million dollars and the center of Chicago’s social life for many years, was sold yesterday to a New York syndicate. It will become the site of a tall apartment building. *Bob Newhart turns 15. He’s a sophomore at St. Ignatius High School. *More than 92,000 fans come out to Soldier Field to watch the 12th NFL Chicago All-Star Game: The Green Bay Packers beat the College All-Stars 19-7. *PRICE CHECK: Soap Powder 29 cents, and coffee is 42 cents a pound. 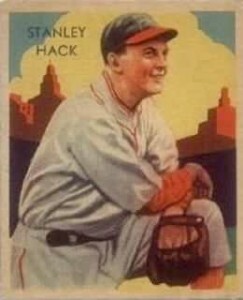 *Stan Hack gets his 2000th career hit, a single against Pirates pitcher Preacher Roe. Cubs lose 6-4 in Pittsburgh. *Phillies Vince DiMaggio ties NL record with 4th grand slam of season. *White Sox star Luke Appling is discharged from the Army. *The Red Sox aren’t as lucky. Their star slugger Ted Williams celebrates his 27th birthday this week, and is still serving in the Armed Forces. *At Wrigley Field, the Cubs win two from the Reds, 7-2 and 7-1. Andy Pafko hit a grand slam in the first inning. 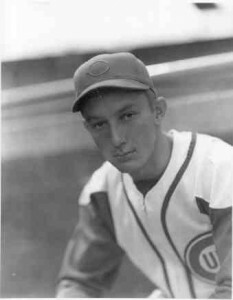 The Cubs win 21 out of 22 games against the Reds in 1945. *Sergeant Frank A Parker beats William Talbert in the 65th U.S. Open in tennis. *“Incendiary Blonde” starring Betty Hutton is released. *Two future musical prodigies are born this week: Van Morrison and Itzhak Perlman.